The number of people killed in a powerful storm and preceding floods in Mozambique could exceed 1,000, the president said, putting the potential death toll far higher than current figures. Eighty-four deaths are confirmed so far in Mozambique as a result of Cyclone Idai, which left a trail of death and destruction across Zimbabwe and Malawi in addition to Mozambique, with vast areas flooded, roads destroyed and communication wiped out. Speaking on Radio Mocambique, President Filipe Nyusi said he flew over the affected region, where two rivers overflowed. Villages disappeared and bodies were floating in the water. “Everything indicates we can register more than 1,000 deaths,” he said. The cyclone killed 98 people and more than 200 are missing in Zimbabwe, government said, while the death toll in Malawi from heavy rains and flooding stood at 56 last week. No new statistics are available following the cyclone’s arrival in Malawi. 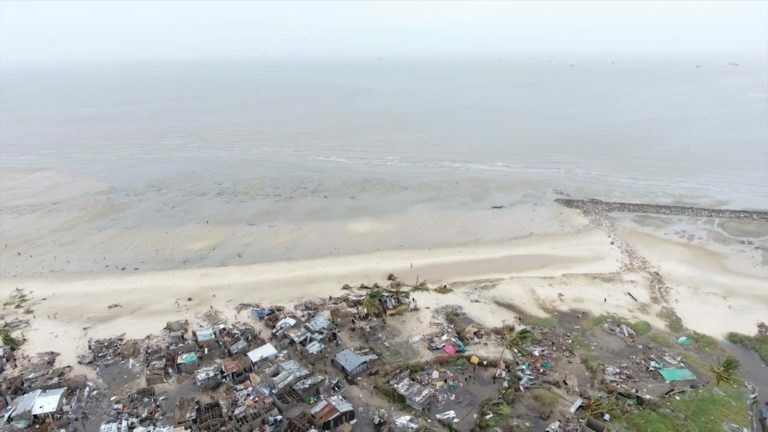 Caroline Haga, a senior International Federation of the Red Cross official in Beira, said the situation could be far worse in surrounding areas, which remained completely cut off by road and where houses were not as sturdy. Nyusi flew over areas otherwise accessible some of which were flooded before Cyclone Idai. In Beira, Mozambique’s fourth-largest city and home to 500,000 people, a large dam burst, further complicating rescue efforts. Large swathes of land were submerged and in some streets people waded through knee-high water around piles of mangled metal and other debris. In the early hours of Monday, rescuers launched dinghies onto chest-high waters, navigating through reeds and trees – with some people on branches to escape the water – to rescue those trapped by the flooding. Rescuers were also struggling to reach people in Zimbabwe’s Chimanimani district, cut off from the rest of the country by torrential rains and winds of up to 170 km/h that swept away roads, homes and bridges and knocked out power and communication lines. Zimbabwe’s treasury released $18 million to rebuild roads and bridges, provide water, sanitation and electricity. Families began burying the dead but the death toll is expected to rise. Many people have been sleeping in the mountains since Friday, after their homes were flattened by rock falls and mudslides or washed away by torrential rains. The Harare government declared a state of disaster in areas affected by the storm. Zimbabwe, a country of 15 million people, is suffering a severe drought. Beira, at the mouth of the Pungwe River, is home to Mozambique’s second-largest port, serving as gateway for imports to landlocked countries in south-east Africa. The director of a company jointly managing the port, Cornelder, based in the Netherlands, said the port closed last Wednesday but would hopefully resume operations on Tuesday. Two cranes would be working and the company had two generators and sufficient fuel for now, though damage to access routes and roads further inland was a problem, said a director, who asked not to be named. The fuel pipeline from Beira to Zimbabwe is believed to be intact, the person said, though communication was still patchy and the situation at the port remained uncertain. In February 2000, Cyclone Eline hit Mozambique after it was devastated by the worst floods in three decades. It killed 350 people and left 650,000 homeless across southern Africa, also hitting Zimbabwe.